Live as the locals do, in The Strathearn Residence. 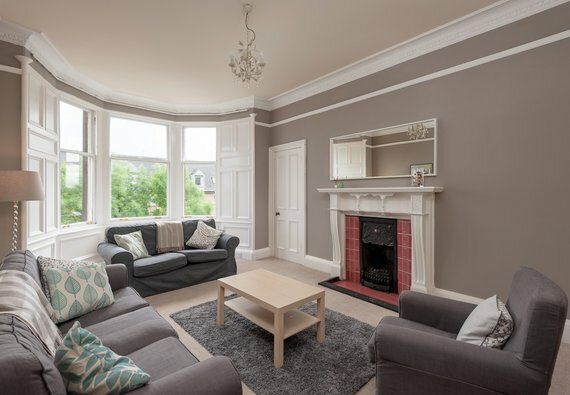 Sitting pretty in lovely, leafy Marchmont, this tranquil apartment is ideal for your next visit to Edinburgh. Sleeping up to six guests in three double bedrooms, this delightful Victorian property benefits from original features and generous proportions. Sit back and relax in the large living room, bathed in light from the glorious Victorian bay windows. A smart TV with soundbar, DVD player and WiFi can provide some light entertainment, while the original features such as ceiling cornicing and fireplace add a bit of traditional charm. The large kitchen and dining room is light and airy, perfect for self-catering whether you fancy a quick breakfast before a day’s exploration, or a fully-fledged dining extravaganza. A small utility cupboard houses the washing machine and tumble drier, and the main kitchen area has all of the other usual mod-cons, including a dishwasher and Nespresso machine. Three gorgeous bedrooms with double beds and guest storage ensure a peaceful night’s rest. A family bathroom with shower over bath completes this home from home. The Strathearn Residence is located in Marchmont, a laid back and friendly area just a ten minute walk from the Old Town. Just around the corner from the apartment on Marchmont Road are plenty of independent cafes and shops as well as a good sized Sainsbury's local for grocery shopping. The Meadows, one of Edinburgh's most loved parks, is a few minutes stroll away and perfect for a picnic or morning jog. If you're staying during the Festival and Fringe, then George Square, Underbelly and the Pleasance are all within a 20 minute walk. Entry to the apartment is from 16:00 onwards; and check out is before 11am. Please note that this apartment does have a TV, however the photos were taken before it was put in place. Accessibility statement This property is not wheelchair accessible and likely not suitable for those with mobility issues as it's located on the top floor without lift. No reviews yet for The Strathearn Residence.